Transcribed as written by Bonnie Snow with permission of the Historical Society, thanks Society! Jan 3 1818: The Church at Richland met____. After praise and prayer proceeded to business. First rec'd. into fellowship Bro Gaius Dickensen and his wife Mary Dickensen, and Margaret Pugh. Received for baptism, George Pugh. Took up the business of electing two Deacons and a Clerk and laid it over till our next meeting. Proposed to partake of the Lord's Supper at our next meeting and appointed Bro Calob Browning and Robert Blackburn to attend to the providing elliments. Feb 1818: On Saturday before the first Sunday in Feb. Took into consideration the size and form of our Meeting House and determined on the size and plan and appointed Bro. Calob Browning and Robert Blackburn and George Pugh to attend to the drawing an article for the same with the plan of it. Then took in to consideration whether we would get a Church Book and decided in favor of it. On Sunday rec'd into fellowship Sarah Jackson and Elizabeth Jackson. March 1818: Took up the refference of the Deacon and Clerk and laid over till our next meeting. April 1818: On Saturday before the fifth Sunday in April, rec'd for baptism Sarah Powers, Cynthia Clark, Henry Adams, his wife Nancy Adams, and Nancy Cambridge, rec'd by letter James Egnew, Daniel Williams, Isaac Gruell and his wife Catherine. May 1818: Rec'd by letter sister Nancy Adams, Mary Blackburn, Peggy Marsh, Susan Marsh, Polly Marsh, Nancy Pollard, Rachel Forsythe and for baptism Calob Browning, Jr., Henry Colvin, Jr., Spencer, servent of Archa Duncan, Adam Dounard (Downard) bs, and Elizabeth Marttiel. Elected Bro. Robert Blackburn and Isaac Gruell as Deacons. Chose for Clerk, Bro. George Pugh. Then took up the reffrence of out meeting house and determined on Br. Blackburn's place. June 1818: First a motion made that this Church be joined to the Union Association and was sanctioned. Then elected Bro.s Gruell, C. Browning, and G. Pugh as a committee to draw an article for the purpose of building a House. Elected D. Williams, James Egnew, C. Browning, and Isaac Gruell to bear a letter to the association. July 1818: Rec'd for baptism Margaret MCan, Nelly Anderson, Sarah Williams, Thomas Pollard, David, slave to Samuele Arnold, Samuel, Slave to J. Garrard. Aug 1818: Rec'd for baptism, Lucy Sharp, then took up the business of the subscription and determined in favour of the one shaped by Calob Browing, Blackburn and Pugh. Sept 1818: The Church met and elected Bro. Grewell moderator, pro-tem, then a motion made and second and agreed to that we should commune twice a year vi in the monthes of April and September and that the same shall become a rule of Decorum. Oct 1818: On motion took into consideration the ordiantion of our Deacons and appointed our next meeting for that purpose and agreed that we should Commune at our next meeting. On motion that male members get an equal proportion of the Meeting House logs and have them on the ground on or before the first of November next. Nov 1818: No business coming before the Church. Bro. Elkin preached a sermon which was followed by Bro Morton. The meeting concluded by Bro. Holton, by the way of exhortation and prayer to meet at our next in course. Dec 1818: No business transpired. March 6, 1819: Motion made and seconded that 3 members be appointed to draw a Subscription for covering the Meetiong House and chose Bro. Long, Grewell, and Pugh. The subscription to be drawn thus; that the subscribers to pay the sums next to their names in good trade---corn and sithy. The 13 and 22nd is days appointed to raise the Meeting House. A motion made for a Covenant in the Church and was disannuled by a large majority and then adjourned till our next course. April 10,1819: First a motion made and seconded that a Committee be appointed to settle business between Bro. Gaius Dickenson and Prince. Bro Browning, Blackburn, and Grewell appointed. The suberscriptions received by the Church, dated March 12th, 1819, members appointed to take the supscriptions, Bro Long, Pugh, and Pollard. May 8, 1819: The committee appointed to settle business between Bro. Dickensen and Prince, reported that it was amicably done. June 1819: On Saturday before the Second Lord's day in June the Church met at Bro. Gruells and agreed to appoint Bro E. Monroe, Modrator. First appointed Samuel Long, Clerk pro-tem. Received four superscription papers. Agreed to appoint a committee to superintend the lettin out the Covering of the Meeting House and other work. Our next monthly meeting to be held at Bro Daniel Williams. July 1819: The Church met at Bro. Blackburns. On motion to proceed to call our pastor and made choice of Bro. Isaac Munson. Bro's Wm. Browning, I Gruwell, and James Egnue as members to the association. Nominated Bro Long and Gruwell to bear a letter to Bro Munson on the decision of the Church and to shape the same. Agreed to get a day book. Aug 1819: Church met at Bro Williams. Elder Isaac Munson agreed to attend us as pastor. Appointed Isaac Gruwell as clerk. Our next meeting to be held at Bro. Blackburns. Sept 1819: At a church meeting held at Bro. Blackburns, appointed Bro. Long, moderator. A motion made to release Bro. Gruwell from the Deacon place and appoint another at our next meeting. Oct 1819: The meeting was held at Bro. Long's. Pruseeded to business choosing a deacon by private ballet the church chose Bro. Wm. Browning. Nov 1819: The church meeting was held at Bro. C. Browning's. Dec 1819: A member from the Northfork Church asked for help to Constitute a Church. Appointed Bro's Browning, Egnew, and Gruwell. Jan 1820: At a Church meeting held at Bro Pollards, a report was handed that Bro Pugh had been intockated (as written, intoxicated ?)bs. Bro Browning appointed to visit him, also Sister Sinthy Clark, sent for and the Black Sister and to attend the next meeting in order to give an account of their selves. Feb 1820: Meeting held at Bro Blackburn's. Motion agreed that Bro Browning, with James Richey for plank to lay the floor of the Meeting House. Bro. George Pugh and wife dismissed by letter. Agreed that our next meeting to be at the Sturts Schoolhouse. Mar 1820: At a Church meeting held at the Schoolhouse, then took up the case of Black Sister and excluded her from us. Sisters, Sarah Jackson and Mary Jackson dismissed by letter. April 1820: A church meeting held at Bro. Brownings the members took up the case of Dicksons and his wife, and Bro. Henry Adams and his wife and moved all excluded from us. May 1820: Church meeting held at Bro Blackburns, no business. 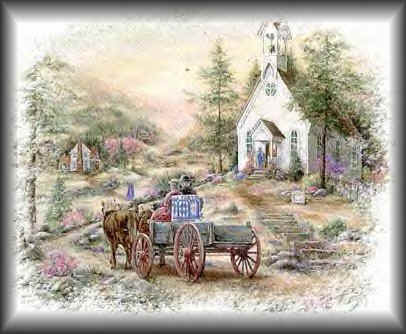 June 1820: Church meeting held at the Richland Meeting House. Sister Nancy Stevens dismissed by letter. July 1820: Church held at Richland Meeting House. Bro Gruwell appointed to write the letter to the Association. Bro Blackburn, C. Browning, and Long appointed to bare the same. Aug 1820: Church meeting held at the Richland Meeting House, chose Bro. Long as moderator. Sept 1820: Church meeting held at the Richland Meeting House, took up the case of Bro. Hatfield, laid over to our next meeting. Then was handed in a letter from Bro. Long which was read. Then appointed Bro. Browning, Gruwell, and Blackburn to visit Bro Long. Bro. Dickson sent to the church for a letter of dismission. Not granted. Oct 1820: Took up the case of Bro. T. Hatfield and he was excluded. Then took up the case of Br. Long, and he withdrew himself from the church and requested certificate and the church granted it. Nov 1820: November meeting was dismissed from count of bad weather. Dec 1820: At a Church meeting held at Bro Gruwell's the first Saturday in Dec. they chose Bro. Monroe as moderator. Sister Clark applied for a letter of dismission for herself and Cynthia.